The FDB Multilex drug database provides comprehensive coverage of UK medications and integrates into leading clinical systems to support safer prescribing and dispensing at the point of care. When integrated into electronic health record (EHR) and e-prescribing systems, FDB Multilex supports active clinical checking against a patient’s medication record, giving clinical staff, the support and information required to safely prescribe the most appropriate medications. The real-time clinical alerts and warnings highlighted within the prescribing process assist in reducing the risk of medical errors. FDB Multilex is the UK’s leading active medication clinical decision support solution, deployed in over 10,000 sites and across a wide range of healthcare settings including primary care, secondary care and community services. 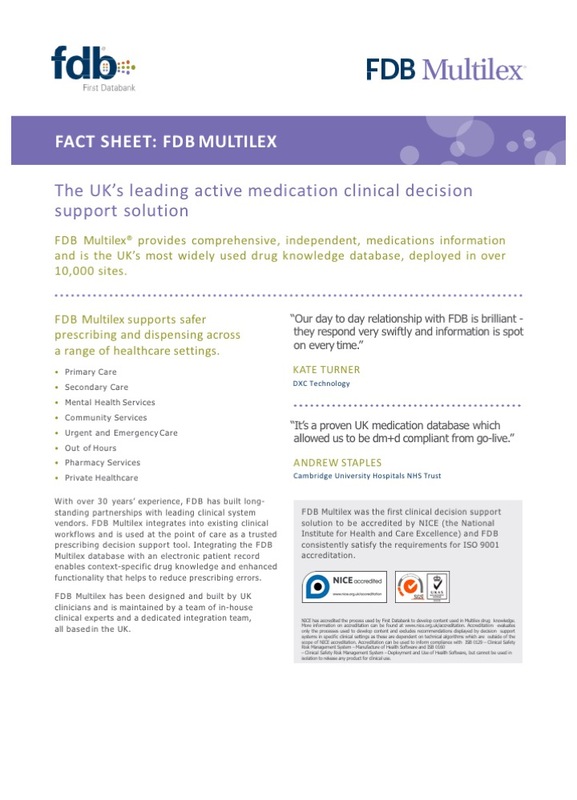 Download the free Multilex factsheet today to find out why FDB Multilex is the UK’s most widely used drug database and e-prescribing decision support solution.